It was still a bit chilly yesterday, a light northerly wind and the odd shower, but that did not deter our team at Middle Camp who put 40 salmon in the book; James F struck gold up at Pashas where he landed nine in an hour and a half before generously handing the rod over to his guide Sasha. 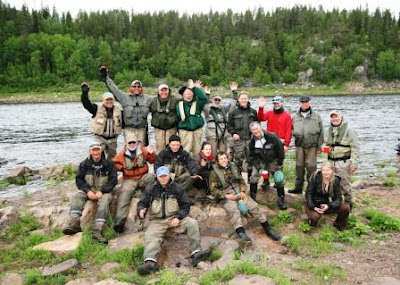 A really great team this week – and for us here so rewarding to see new guests trying salmon fishing – some young some a tad older but all soaking up the Varzuga experience. Talking of gold, our young dog Zlata (gold in Russian) is finally learning her trade as a camp guard dog and last night, for the first time, started to bark and move off a large bear that came close to camp. About five of our guests had a good view of him from 25 yards or so before Zlata suddenly kicked into her role and after ten minutes or so had seen him off the island. ﻿ ﻿﻿﻿﻿﻿﻿﻿﻿﻿﻿﻿Up at Pana the water rose all day after Thursday’s rain and their catch was down to just under 40, however they should be on about 300 salmon for the eight rods this week. Kitza had another good day with about 45 landed and I guess they will finish with over 300 salmon for the week – a great result. This morning we leave early for Murmansk and home. It is always a wrench to leave both the Varzuga river I have known for many years and of course our Russian friends who are so much part of it and who truly care for it. What a wonderful fishing season we have had on Varzuga, one of the best.